The Dam is located in front of the reception, where animals come to drink at night. Kololo offers the Big 5 experience in combination with accommodation in a luxurious lodge where only the safe wildlife roams free. Welgevonden has beautiful savannah's, rivers, lakes and mountainous landscapes. Kololo Game Reserve spreads over untouched African bush with open savannah grass plains, thick bushveld, making it the ideal habitat for a variety of wildlife. The two wooden terraces of the restaurant offer unrivaled views across the plains of the neighboring Big 5 nature reserve Welgevonden. No dangerous animals reside, therefore guests are free to explore walking trails (from 2 - 15 km), either on foot or by mountain bike. Hiking and cycling is a unique experience because it brings you closer to nature, as you are part of the natural environment and not experiencing it in a vehicle. Kololo Game Reserve is situated in the beautiful province of Limpopo, South Africa, in the heart of the Waterberg biosphere. Kololo borders to the Big 5 Welgevonden Game Reserve (located approximately 200 m from the reception and restaurant). child friendly and home to a large variety of game, Kololo is a perfect safari destination. Visit neighbouring reserve Welgevonden Game Reserve (of which Kololo is also part) and view the Big 5 - lion, leopard, elephant, rhino and buffalo - or enjoy a sneak preview over the fence, from the comfort of your chalet at Kololo. The swimming pool is located in front of the restaurant, surrounded by a wooden terrace with sun beds and parasols. Drinks and snacks can be ordered from the restaurant. The swimming pool is available at no charge to all guests. The story of Kololo Game Reserve dates back to mid-1910. At this time a farmer called, Oom Piet, started a farm on this property. The farmhouse he built in 1916, is now completly renovated and in use as one of our chalets: ‘Oom Piet Chalet’. Kololo Game Reserve is located in the middle of the beautiful Waterberg Area, a nature area with a wide variety of landscapes and wildlife. The area has been declared a biosphere reserve by the UNESCO. Kololo Game Reserve is part of the "Waterberg Biosphere" project, which means that Kololo has to meet strict requirements in order to protect nature. Kololo Game Reserve is located next to Welgevonden Private Game Reserve. Welgevonden is about. 34.850 ha. (Welgevonden fence just 200 m from the reception and restaurant). A part of Kololo Game Reserve is incorporated in Welgevonden. Vaalwater is the closest village, 35 km (mostly dirt road) away from Kololo. It is a small rural village with a supermarket, curio shops, petrol station and one or two basic restaurants. Many of the employees of Kololo live in Vaalwater. 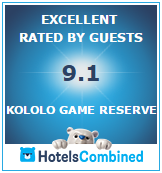 Why choose Kololo Game Reserve?